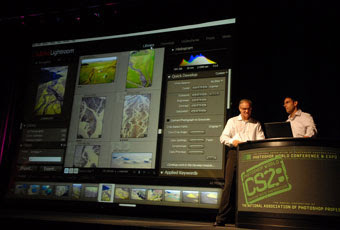 Here’s what’s going on:â¢ It’s official; Adobe will be making their official CS3 annoucment on March 27th (not just Photoshop, but the full Creative Suite Product Line) at a special “Launch Event” in New York City. As John Nack noted on this blog; this is the official announcement of features; not the shipping date for the product. Here’s the scoop straight from Adobe’s PR blog. â¢ I did an interview with Dave Cross last week about Lightroom and the future of the digital photography workflow. I’ve been told it’s a surprisingly candid interview (which means I probably said some things I shouldn’t have said) and you can read it at Peachpit.com. NOTE: Please click the Comments button at the bottom of this post to read a great follow-up comment posted this morning by George Gerder. It’s a perfect add-on to this theme. â¢ NAPP is very honored to announce that John Loiacano, Adobe’s Senior VP of Creative Solutions, will be the featured keynote speaker at the Photoshop World opening keynote (John is shown above during his keynote presentation at Photoshop World Las Vegas last year, where he and Adobe’s Kevin Connor gave the audience a first look at some of Lightroom’s new features, and a sneak peek at some upcoming Photoshop technology). John is a first-class presenter who totally energized the Las Vegas crowd, and with the all new technology coming out of Adobe (including the upcoming release of CS3), I can only imagine what he has in store (OK, actually I kind of know what he has in store, and trust me—his keynote will be the talk of the industry). You can see some shots of his Las Vegas keynote here. My Lightroom Book is Off Press!